1. Civil hospital, Dow University of Health Sciences, Karachi, Pakistan. 2. Institute of Psychiatry, Baqai Medical University, Karachi, Pakistan. 3. Civil hospital, Dow University of Health Sciences, Karachi, Pakistan. 4. Liaquat University of Medical and health Sciences, Jamshoro, Pakistan. 5. Isra University Hyderabad, Pakistan. 1. Neurology Section, Department of Medicine, Karachi Medical & Dental College and Abbasi Shaheed Hospital, Karachi, Pakistan. 2. 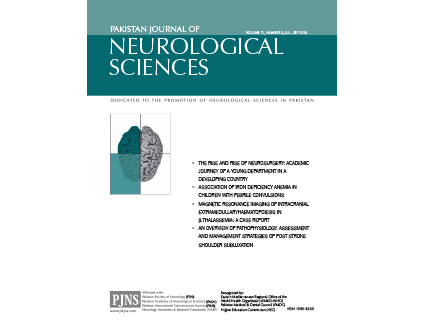 Department of Neurology, Jinnah Postgraduate Medical Centre, Karachi, Pakistan. 1. Department of Radiology, Civil Hospital & Dow University of Health Sciences (DUHS), Karachi, Pakistan. 5. Consultant Physician, PAEC general hospital, Islamabad. 1. PAEC General hospital, Islamabad. 2. Department of Neurology. Pakistan Institute of Medical Sciences, Islamabad. 1. Department of Neurology, Pakistan Institute of Medical Sciences, Islamabad, Pakistan.